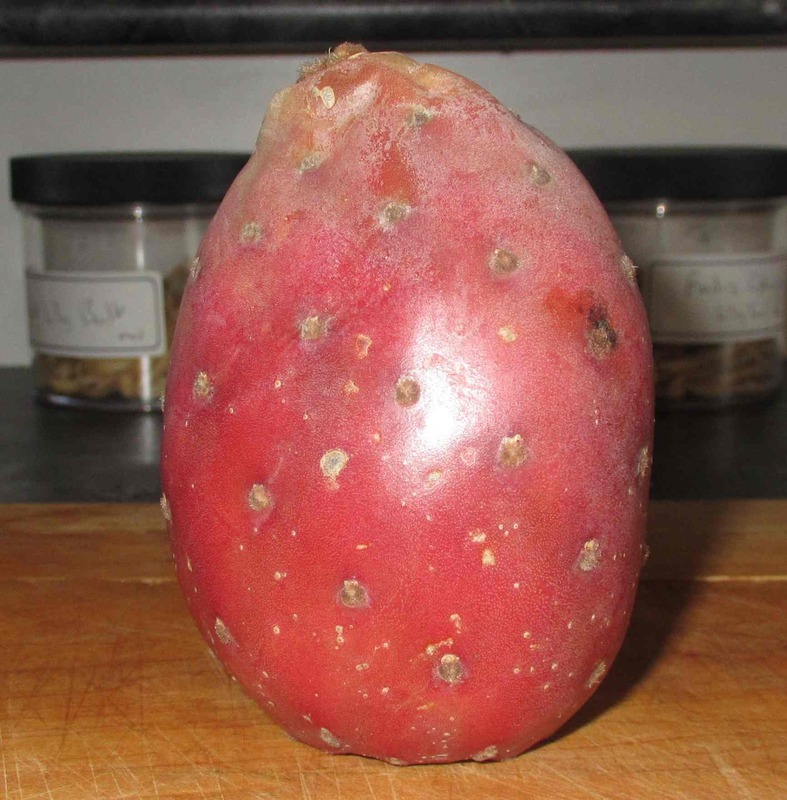 This curious item, which looks a little like a russet potato with lots of eyes, appeared on the shelves of our local grocery store labeled as ‘Cactus Pears’. The name was unfamiliar to me but, when I Googled it, I discovered that the same article is often called ‘Prickly Pears’, which I have heard of before. I should note here that, according to Wikipedia, the name ‘Prickly Pear’ is shared by quite a few different things but is most commonly used to refer to this particular fruit. 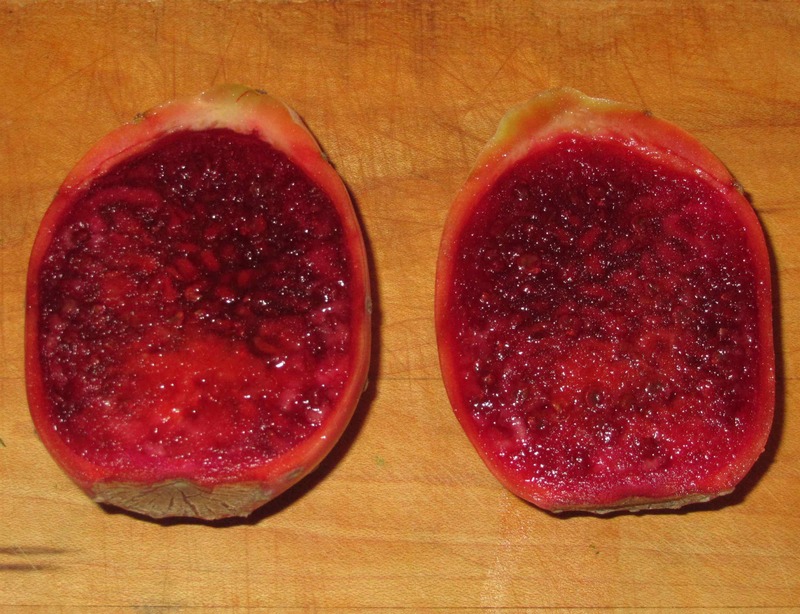 I’m not sure why, but for some reason I rather expected the interior of the fruit to be white, or light colored, at least, and thus I was quite taken aback by the vivid red color you see above. 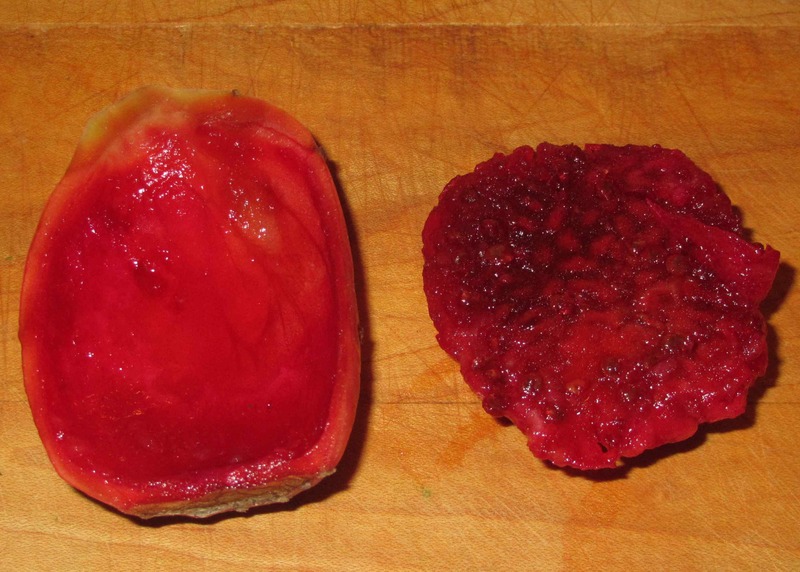 If you look closely, you can see that the rind is fairly thick and the rich, ruby pulp is full of little seeds. One could, I suppose, cut or peel away the rind rather like an orange, but it is much easier to slice the fruit in two and then remove the pulp from each half. This is not quite as easy as popping the pulp out of a Rambutan, for instance, but a spoon will scoop it out quite cleanly, as you can see above. I find it amazing that your market carries such a great variety for products…that is so nice. Sorry to hear that…I have always found it so interesting that you get so many great ingredients for your cooking. In Mexican cooking the “paddles” from the paddle cactus are sliced, cubed and cooked like string beans. They call the sliced paddles Nopales because they come from the Nopal cactus. Nopales have a soft but crunchy texture that also becomes a bit slimy/sticky. like okra, when cooked. It has a flavor similar to a slightly tart green bean, asparagus, or green pepper. The fruit, “tuna” in spanish, grows all over the Nopal cactus and is visually appealing. Many people peel them, cut them and eat them. They are full of hard seeds but have a pleasant taste if you can get past the seeds. When you eat them it’s like a machine gun going off in your head. We find them all over here in Texas and the Southwestern US. You can juice them and use them for glazes on meats and desserts, as well as for jams. I’d love to try the ‘paddles’… I saw some nice recipes while researching. I’m hoping there are still some in the store for when my wife finally gets back from her travels! We have these in our garden and they are ripe at the moment, but the problem I always have with them is getting the prickles off the pears. I have heard that chewing gum does the trick, but I haven’t put that to the test yet. That’s a novel approach… I didn’t come across that one while researching! Everything is better with tequila! Excellent way of telling, and good post to get information about my presentation subject, which i am going to present in school. happy. I’ve learn this post and if I may I desire to counsel you some fascinating things or suggestions. Maybe you can write next articles referring to this article. I desire to read more issues about it!